Renting a 9 seater is especially suitable for families and small groups. You can use our transparent online price comparison to compare offers for 9 seat rental cars from different car rental companies. Renting a rental car with 9 seats is easy via our Driveboo.com website. Simply select a suitable offer and book your minibus online at Driveboo! 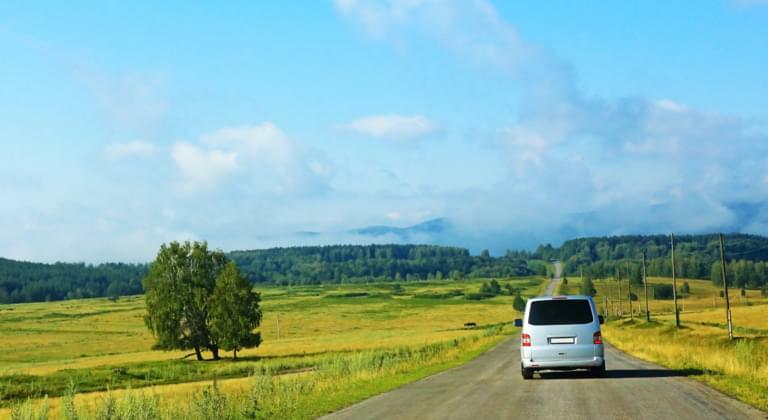 If a large family or group would like to travel together, they ideally do so with a 9-seater minibus or a van designed for passenger transport. Travelling with a spacious car, such as a VW bus, has many advantages. The following article explains what to consider when renting a 9-seater. A holiday before or after the weekend results in several days off, which can be used for a short holiday if the weather is fine. Often friends want to spend the long weekend together and this would mean that a group of seven to nine people would have to drive several cars. This in turn means high fuel bills, wear and tear on all vehicles involved and at least two, but probably more drivers. In this context, it is much more sensible to have a cheap rental car that offers sufficient space for everyone involved. Ideally, this group opted for a 9-seater minibus from a car rental company that combined its van format with the amenities of a car. In a rental car with nine seats, all members of the group have plenty of space and there is enough room for necessary luggage or other travel equipment. If the group consists of less than nine people, a 9-seater is nevertheless recommended, as the amount of storage space is increased by folding down the unused seats. This makes the reasonably priced Neunsitzer bus, which can be rented for a reasonable price, also ideal as a transporter for camping equipment, the barbecue and similar bulky objects. What are the advantages of renting a 9-seater bus? The 9-seater car rental service of your car rental company allows all travelers to reach their destination comfortably and quickly, the option also results in financial advantages. On the one hand, a modern minibus is extremely frugal and on the other hand, it consumes less fuel than two or three cars even when driving quickly. Nevertheless, the costs of renting a minibus or van remain the same. However, the rental price must be in relation to the total cost of all alternatively used vehicles and then the invoice is in favour of the 9-seater. Another advantage of the 9-seater minibus is the fact that the group can look forward to the approaching destination in a relaxed manner, except for the driver. In other words, for the vast majority of those involved, the holiday starts with taking a seat in the rental car. Of course, a 9-seater minibus is not only suitable for a quick weekend holiday, the spacious rental car can also be used to visit interesting events such as concerts or sporting events together. Here too, a 9-seater rental car is the ideal solution, as only one parking space has to be found and only one driver has to be active. Are you looking for a 9 seater van for rent? Then consider booking an MPV with Driveboo.com. If a visit to the local zoo or an excursion to the amusement park is considered, grandparents and children should in many cases participate as well. Since it is not possible to cope with the desire for small children as well as grandpa and grandma in their own car, a large rental car such as an van can be handy. All passengers will find enough space in the rented van for nine persons. The seniors can stretch their legs and there is enough space for the pram. Every family member can take part in the excursion with a rented minibus and everyone can enjoy the day in a relaxed atmosphere. Also for the family vacation the rented 9-seater minibus with big dimensions is therefore a meaningful thing. For example, you can explore Mallorca with the 9-seater bus. The passengers arrive relaxed at their destination and do not have to limit themselves to luggage. As a club, family or travel group, there are many reasons beyond the examples presented here that speak for a 9-seater rental car. Nevertheless, there are a number of criteria that must be taken into account when renting a minibus, which we will be addressing in the next paragraph. What car rental classifications are available for 9-seater buses? The minibus for a maximum of nine people belongs to the transporter class and its handling requires some experience in driving. Few car rental companies lend such rented cars to young drivers, but set the minimum rental age at 21 or more years. Depending on the preferred model, some companies only hire a van-format rental car to customers between 23 and 25 years old. All car rental providers also insist on longer-lasting accident-free driving experience, which must be proven in individual cases for periods of up to two years. Since a 9-seater rental car can incur far higher repair costs after a damage than a conventional car, tenants should always choose the best possible insurance option. Only a comprehensive insurance policy with no excess will cover any damage whatsoever. In addition, an additional insurance policy should be selected for a van-sized minibus with all-round glazing, which specifically regulates tyre and glass damage. If more than one person drives the 9-seater rental car alternately, any additional drivers must be reported to the rental car company when taking over the minibus and entered in the rental contract. If this is not done and an additional driver is responsible for an accident, the rental car insurance will usually expire. And so the rented minibus would be an expensive pleasure for the family or friends.